Thursday, 28 July 2011, Day 247/365. For this birthday I got him an electronic keyboard. I honestly didn’t know what to get him and didn’t want to get yet another DS game when he’s got a few now anyway and I knew he was also getting money for his birthday. The Surfer actually suggested this and I’m glad he did. I’d already asked JJ if he wanted to do piano lessons and he expressed an interest. 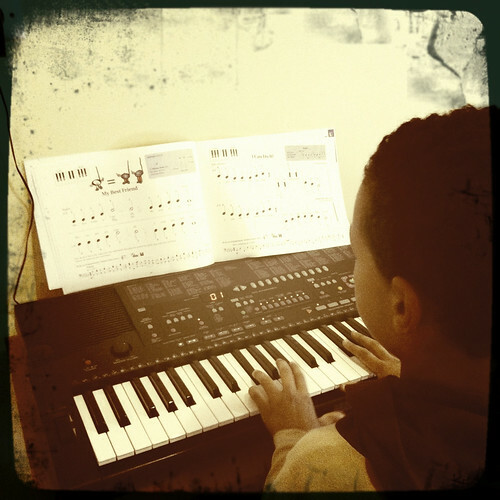 So he got the keyboard for his birthday and started piano lessons a week ago. So far he’s been practising without me prompting him too much. I hope his interest sticks with it and he enjoys it enough to learn to play it well.